Here is an important animal. It’s a larval stage – a juvenile – of a sea-going worm, a Polychaete. A fraction of a millimeter across, it will swim for a while as plankton, change shape twice, and turn into a large segmented worm. Its name is Platynereis dumerilii. The adult looks like this. Control systems in organisms coordinate their actions – with what is going on around them, and with other things the organism is doing. Many organisms can do a fair bit of this without having neurons, let alone brains. But neurons are a good way of doing it, and evolved for this role. Our brains are the result of a great expansion and convolution of neural control systems that first arose in the sea something like 800 million years ago. The unassuming annelid above has a place in this story. Earlier this month I went down to a conference in Maryland and heard a talk by Gáspár Jékely, who works at the Max Planck Institute in Tübingen, Germany. 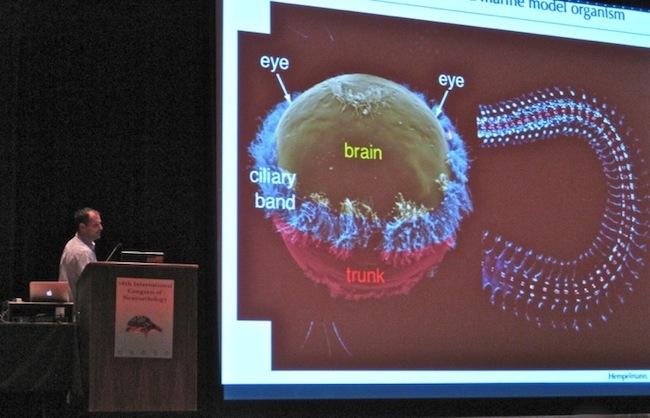 The talk was about the early evolution of eyes and neurons, focusing on this tiny animal. (More can be found here). Its eyes are made of just two cells each, one that senses light and another that blocks light on one side. (Without the blocker, there would be no way of knowing where the light was coming from.) Each light-sensing cell connects to a number of swimming cells, the ones covered with hairs, or cilia, in the pictures above. The combination of sensors and cilia, together with some spiral swimming tricks, enable the animals to track and move towards light. So these are modern versions of the very first eyes? In a sense there are no “first eyes.” Light sensing goes back very deep in evolution, and crept into visibility slowly. A glimmer of light sensitivity is found in some bacteria. 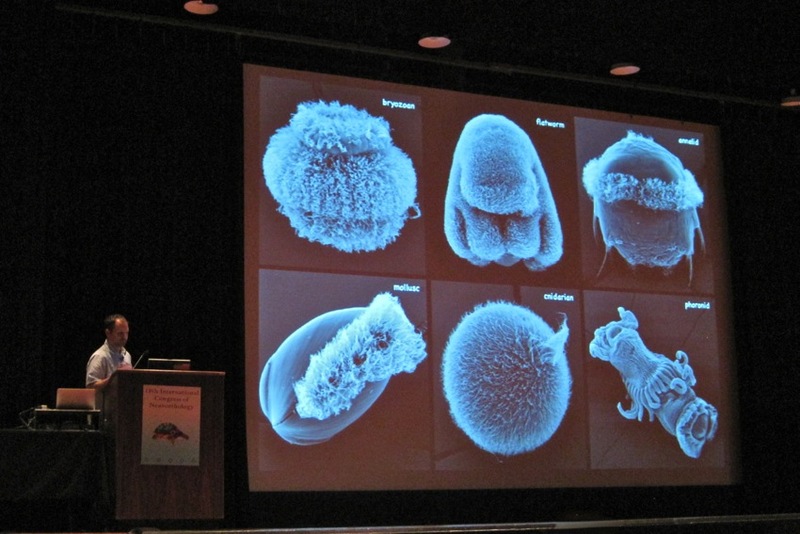 Protists, more complex single-celled organisms, often have “eyespots” and can follow light in three dimensions. If you are going to do something with light, you have to be able to both detect it and act on it. Single-celled organisms bring the parts that do this into mechanical contact. In animals made of many cells, some have visual systems that are not much different – the sensory part and the behavior-producing part are combined in a single cell. 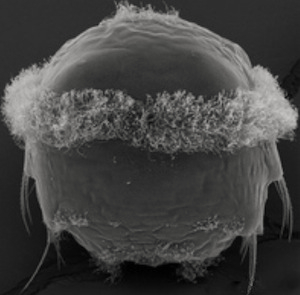 Below is a picture from a paper by Karin Nordstrom and her colleagues, of a cell in a jellyfish larva. The swimming cilium here (looks like a cigarette) is directly attached to the machinery that senses light (looks like teeth) and these are shaded by pigmented areas (look like a three-day growth). The whole organism has many cells, and some are like this, specialized for sensing and swimming. From here you can see what might come next: a further division of labor, into sensing cells and acting cells, connected in such a way that the output of the sensor acts as input to the acting part. (Detlev Arendt has outlined a detailed “division of labor” model for eye evolution.) In the worm larva, this step has been taken; each of the three functions above – sensing, shading, acting – are allocated to separate cells. One reason this helps is the specialization of parts. Another is an economy of scale. If you can signal between sensing and acting parts, a single sensor can control many acting parts, just as a single “cox” in a boat can control many rowers. Such a separation of roles requires, again, a link between the parts – some kind of signaling, in a broad sense of that term. In the worm larva, a chemical released by the sensing cell bridges the gap. The chemical is acetylcholine, which also operates in our own brains. Here the gap between the sensory and active sides is bridged by a single chemical puff. 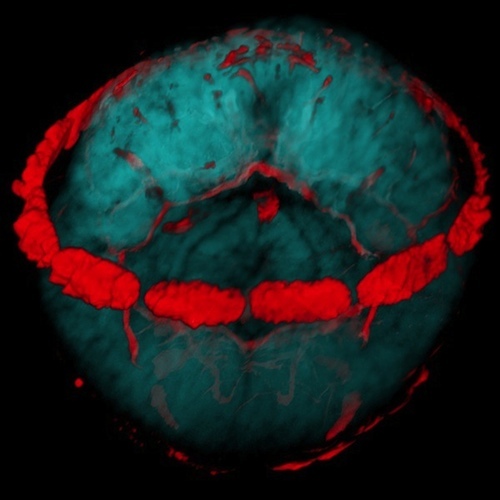 Gaps of this kind are later populated by whole cells – neurons – linked by further chemical signals, enabling more elaborate control, taking on self-propelled patterns of activity only loosely connected to the senses and muscles at each end, and multiplying into the maze in our skulls. The animal in Jékely’s talk is at a pivotal stage in this process; the separation between sensing and acting cells has occurred, but in a way that is about as minimal as it could be. A sensing cell signals to cells that can act, and each eye controls its own ciliated cells, with no apparent coordination between them. The historical separations between these present-day animals lie so far back in time that the similarities between their larvae give us reason to think (with caution) that something like this was present in the common ancestor of all those groups, hundreds of millions of years ago. If so, this is the rough design of some of the first creatures to divide themselves into sensing and behaving parts, signal between those parts, and thereby navigate around the world. In the lower forms of life no one will pretend that cognition is anything more than a guide to appropriate action. The germinal question concerning things brought for the first time before consciousness is not the theoretic ‘What is that?’ but the practical ‘Who goes there?’ or rather, as Horwicz has admirably put it, ‘What is to be done?’ — ‘Was fang’ ich an?’… Cognition, in short, is incomplete until discharged in act; and although it is true that the later mental development, which attains its maximum through the hypertrophied cerebrum of man, gives birth to a vast amount of theoretic activity over and above that which is immediately ministerial to practice, yet the earlier claim is only postponed, not effaced, and the active nature asserts its rights to the end. I’ve always liked this quote, but I think there is something quite wrong about it, as it asserts a kind of ongoing subservience, not merely a historical one, of the theoretical to the practical. I am not sure exactly what “rights” the active nature is thought to retain, but why not allow that the hypertrophied cerebral activity has a role of its own? James’ successor in the pragmatist tradition, John Dewey, did better with this issue. 2. “Another is an economy of scale….”: I think the first person, or one of the first, to write in detail about this was George Mackie, who influenced Jékely and wrote some amazing papers back in the 1970s that I will discuss here another time. 3. The two pictures of Platynereis dumerilii were taken by Gáspár Jékely and appear on websites associated with his lab. Here is the paper that first got me interested in his work. 4. Annelid larval art. And an image of where the evolution of the neuron ended up. Posted in Bodies and Minds, Evolution and tagged brain, evolution, eye, mind. permalink.